Here at the Workshop, Mary and I have been finishing some projects in time for Christmas. 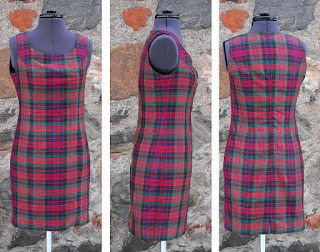 Mary was working on a lovely tartan dress needed for a Christmas wedding. She got that finished on Monday and has spent the last couple of days making herself a tweed jacket. We had a few last minute orders for some hats and scarves. One man had left his Christmas shopping quite late and phoned on Tuesday afternoon to ask if I could make a scarf for his girlfriend. We discussed colours and he decided to pay for Royal Mail's special delivery. He had the scarf by 9am on Wednesday morning! I don't always manage to do things so quickly, but we do try to get our website orders turned around quickly. The embroidery machines have been chuntering away for the last couple of days embroidering tweed patches for Millers Knitwear in St Andrews. 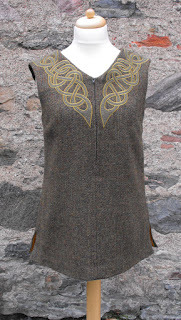 Carolyn Miller designs and makes beautiful knitted garments and sometimes she includes small tweed Celtic knotwork patches making a feature on the jumper, cardigan or whatever, so she will have a good number to work with come the new year. We spent some time on Monday printing our trade calendar. We send this to our main wholesale customers and you may spot it on the wall in some of these shops. It is a year planner in banner format. If anyone wants a copy they are welcome to order one, but as it is expensive to produce, I can't do it for free - email me for details - info@annamacneil.co.uk In with the calendar are invitations to the trade fair at the SECC in Glasgow in January. If you have a retail outlet and are interested in stocking our products, why not come along? 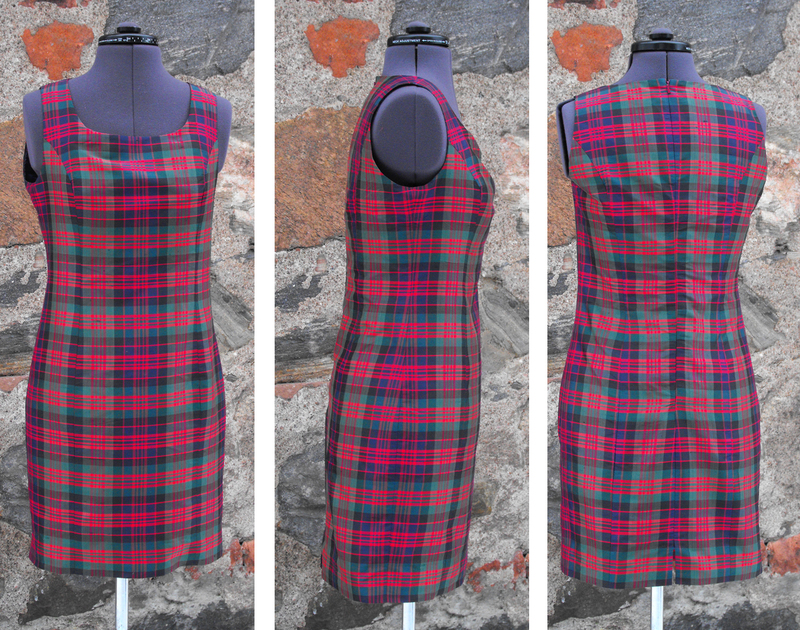 For details, visit www.scotlandstradefairs.co.uk but please note that this is trade only. In between all this, I have been making a cope for my husband. 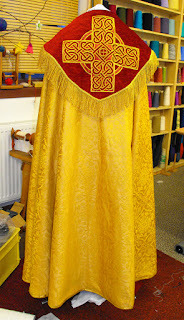 This is a ceremonial cloak type garment worn in church processions and certain services. He wanted a gold one with Celtic knotwork in time for Christmas and I got it finished this afternoon. In return, he promises to give me an updated website for my Ecclesiastical Embroidery website..........watch this space, but don't hold your breathe! 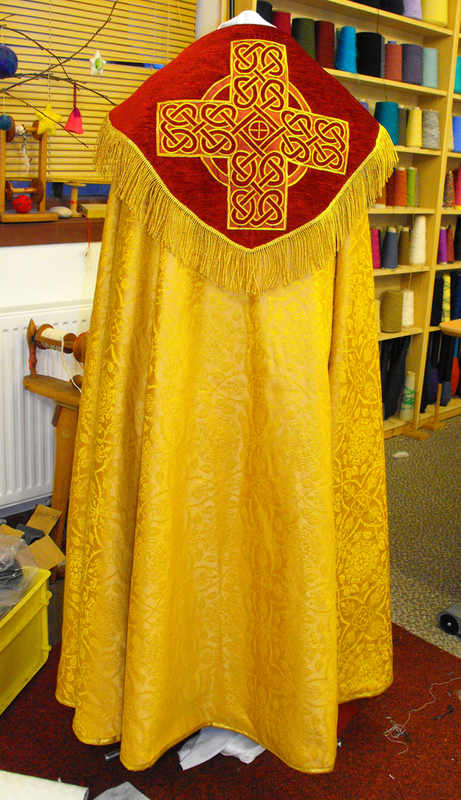 If you want to see the cope in use, come to our traditional festival of nine lessons and carols at the RC Church of St Peter and St Boniface in Fortrose, Ross-shire - 7pm on Friday 28th December. Also flying out of The Workshop over the last couple of weeks has been lots of our Shetland Angels. It is too late now to post any for Christmas, but we have about a dozen left in the shop if you have time to pop in. The Workshop will be closed for the Christmas holidays - closing at 3.30pm on Saturday 22nd and re-open on 4th January. I hope you all have a happy Christmas and New Year. I spent the last week of November on the Isle of Lewis, much of it working on my Hattersley loom. 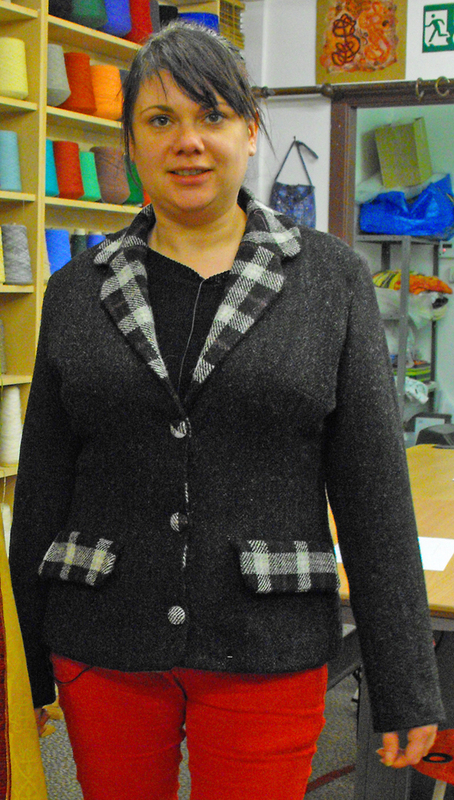 The first task was to cut off the tweed I had woven over my last two visits. I was reasonably pleased with what I had done but I was aware that the warp had been problematic in several places with crossed and tangled ends that resulted in the weaving being rather slow progress. I made the decision to cut it off and re-tie. 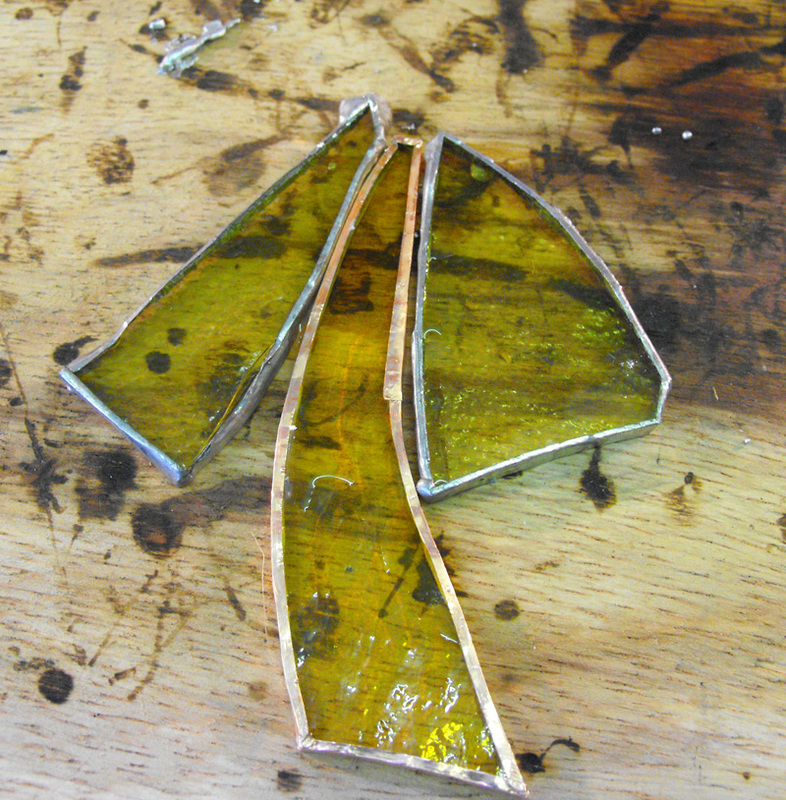 However, I also wanted to try a different weave pattern. Along with the loom I had acquired several sets of heddle boards, each tied in for a different weave pattern. 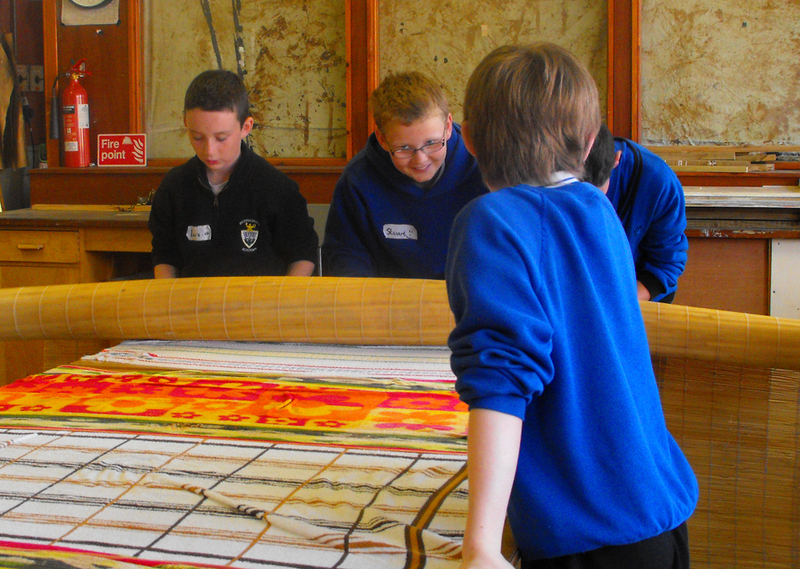 The one put on the loom when we set it up was for Bell's Celtic (picture above) - threading sequence: 1-2-1-3-4-3. 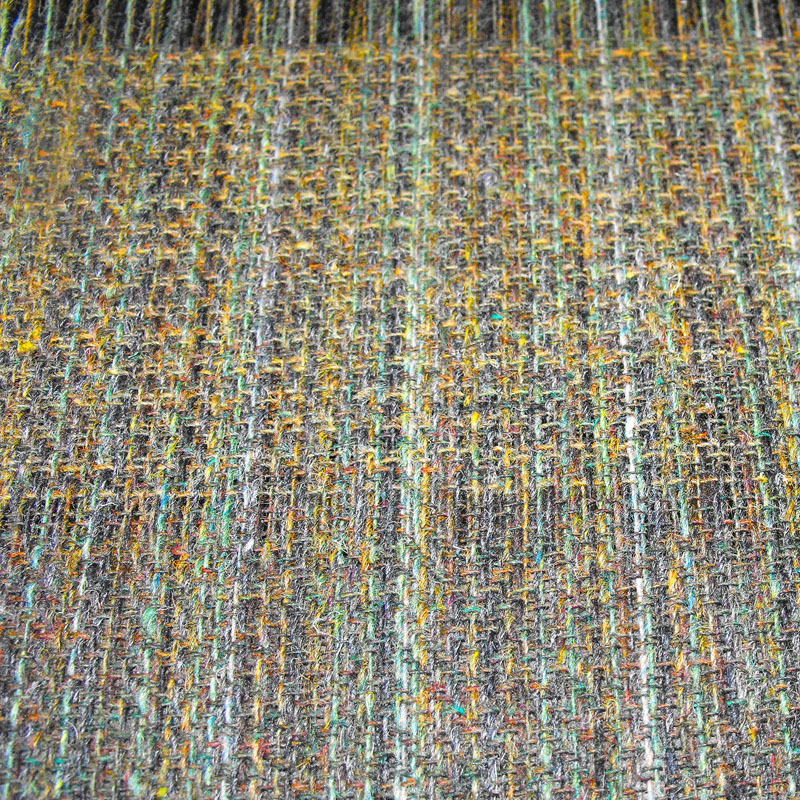 This is a common weave used for mens' sports jackets - quite attractive, but not really what I want to weave. 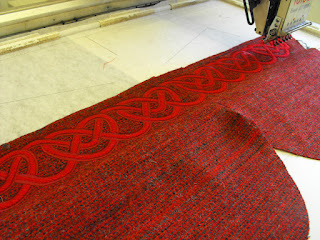 I wanted to set the loom for weaving herringbone. There were three sets of boards set for herringbone. One was for a wide pattern and not really suitable for the tweeds I want for making our range of scarves, wraps and Hebridean Hoods. The other two at first glance looked the same but a quick count established that one was for a much finer cut of yarn. The threading pattern I wanted was 1-2-3-4-1-2-3-4-3-2-1-4-3-2-1-4-3-2-1 - an 8-8 herringbone. I figured out how to release the boards - with a bit of brute force and ignorance, I eventually got them swapped over and set about tying in what remained of my warp (about 10 metres). 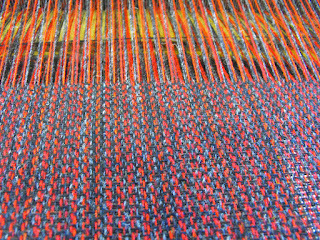 That got me all ready for Angus to come and show me how to adjust the loom to allow me to use two shuttles rather than just one - i.e to be able to weave with different colours of weft yarn. This picture shows the herringbone weave pattern. First there were a few adjustments that needed to be made - a couple of things that were out of place and needed to be adjusted and tightened, then we were ready to go. 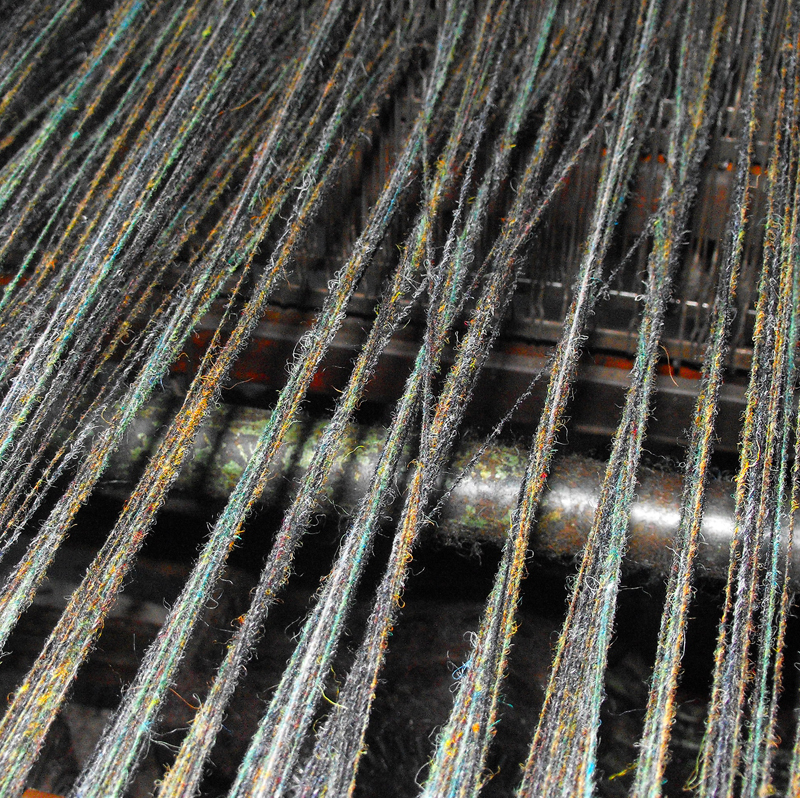 On the right-hand side of the loom is the shuttle box. This is a revolving contraption which will hold up to 6 shuttles. Its position is controlled by a simple system of two small levers which pop up and down. 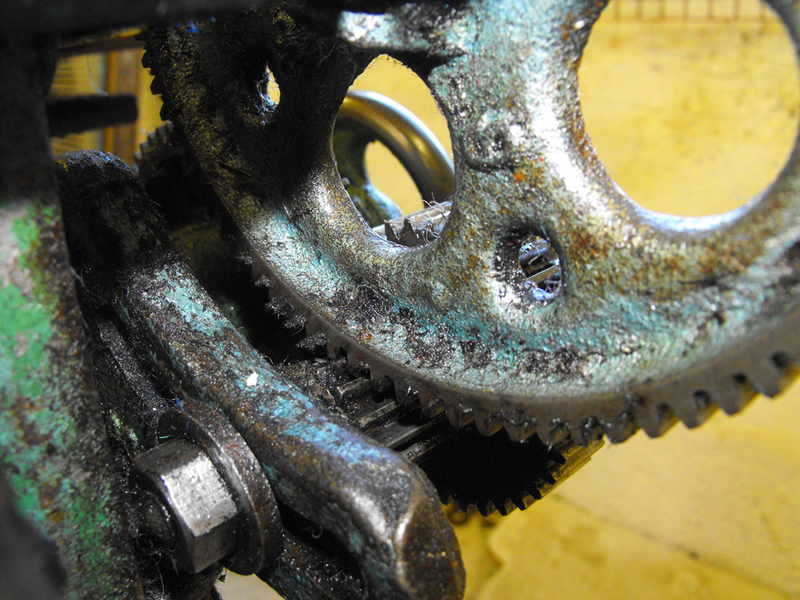 A chain of small metal plates is used to control which lever is up or down. Each plate has a hole at each end - these are simply locator holes that keep the chain on track. They also have a choice of one or two holes in between. If there are two holes, the position of the box does not change. If there is just one hole the box will either turn forwards or backwards depending on whether the hole is on the left or the right. 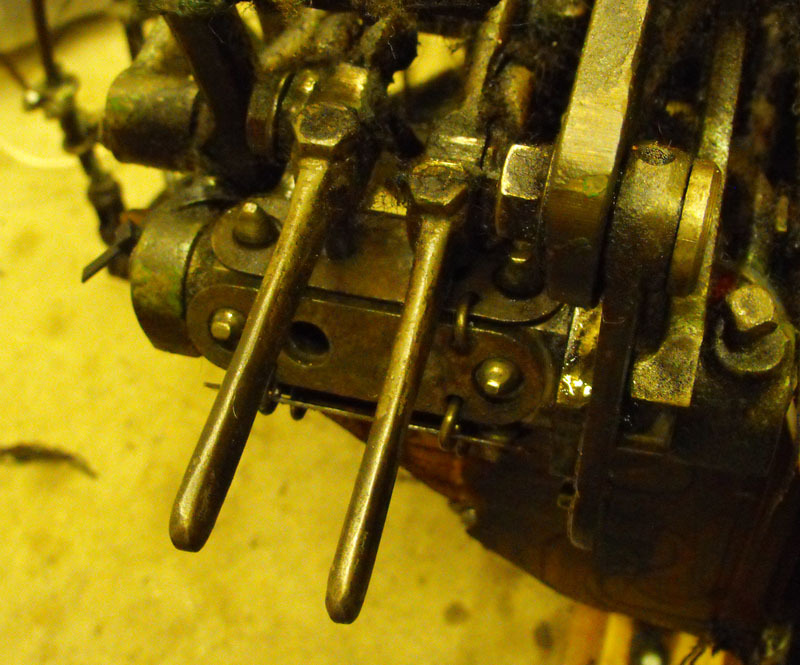 We selected a very short chain of just six plates - the smallest number that you can use to fit into the mechanism. 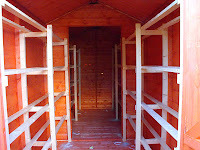 It was set to very simply move the box backwards or forwards between two positions. This means it would create two picks of one colour alternating with two picks of the other colour. 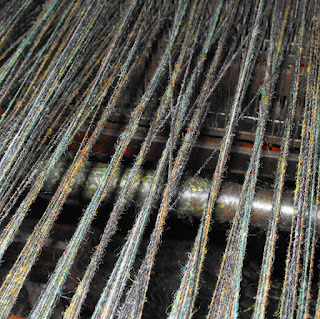 One of the benefits of this system is that it allows one to weave more between stops for bobbin changes simply by using the same colour of yarn in each shuttle. However it does mean you have more to keep your eye on to avoid mistakes and running out of weft yarn. 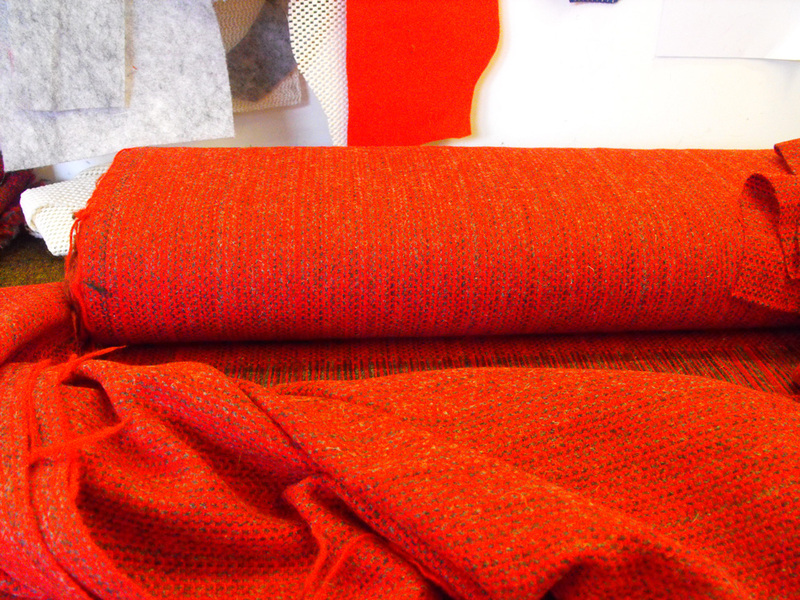 In the photograph the lower section is woven with two shuttles holding the same colour of weft. 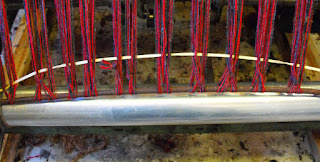 The upper section was woven with a light yarn on one bobbin and a dark yarn in the other. The next day I persevered for a few hours but eventually decided to revert to working with a single shuttle - better to master walking before trying to run a marathon! Over the next couple of days I finished off the warp, weaving 5 lengths of tweed suitable for making into scarves or wraps. 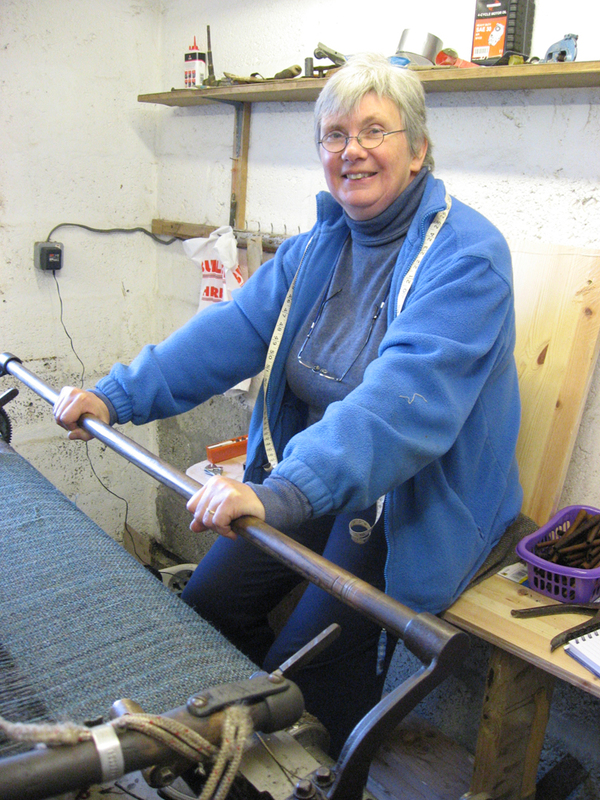 Angus had very kindly brought me a warp that he had prepared and it will go on the loom when I return to Lewis. It will be something of a challenge as it has a definite pattern - no room for errors - and it will look best if I weave it with a mix of three different colours to create a small dog-tooth check. Watch this space! 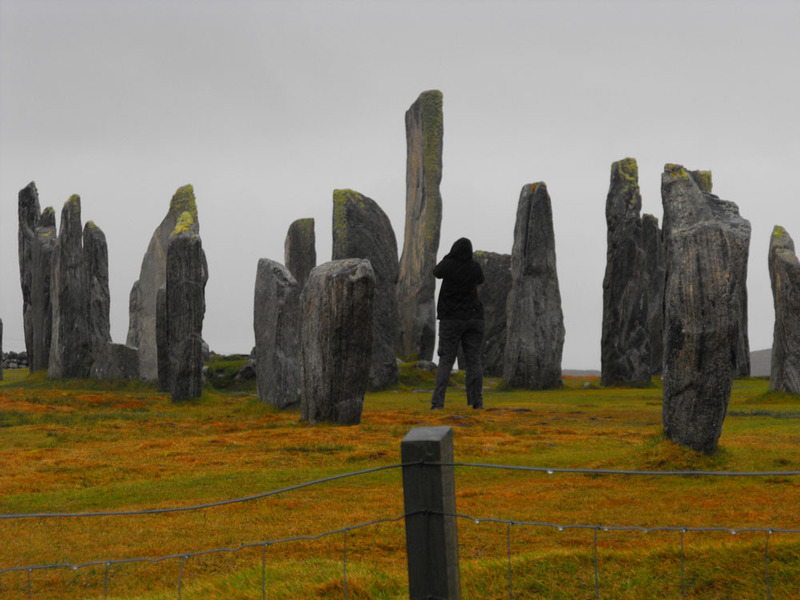 I spent the last few days on the Isle of Lewis. 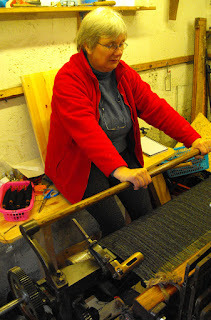 A week ago my stock of yarn for weaving Harris Tweed had been brought out of storage where it has been for the last 7 months and delivered to my loom shed (or my mother's garage, depending on who you are talking to!) 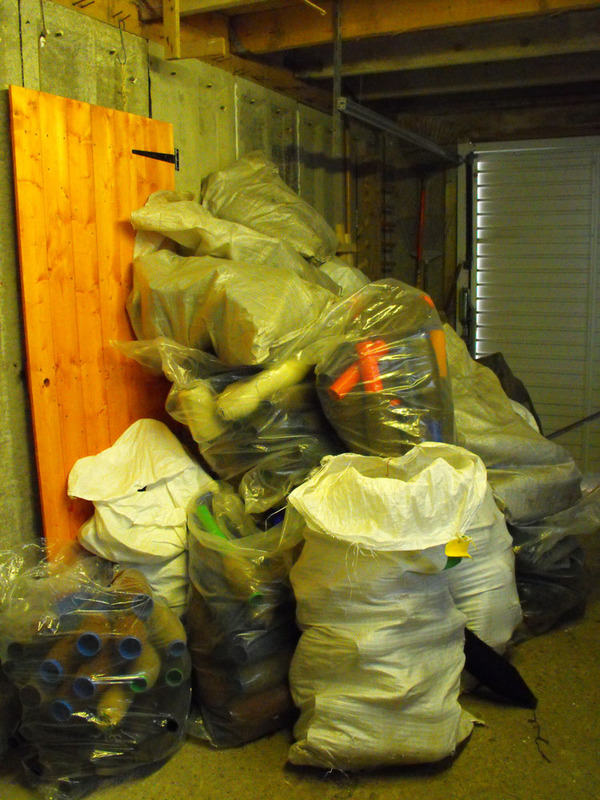 I arrived on Monday afternoon and set about sorting through the sacks of yarn and storing them in some semblance of order in my new shed. I didn't think to photograph the pile before I started. It filled most of the garage. This picture shows it once I had moved about two thirds of the yarn. I found the easiest way to move the yarn was to use the wheelbarrow. I emptied a sack - usually about 15 to 20 cops - into the barrow and trundled it up the path to the shed. 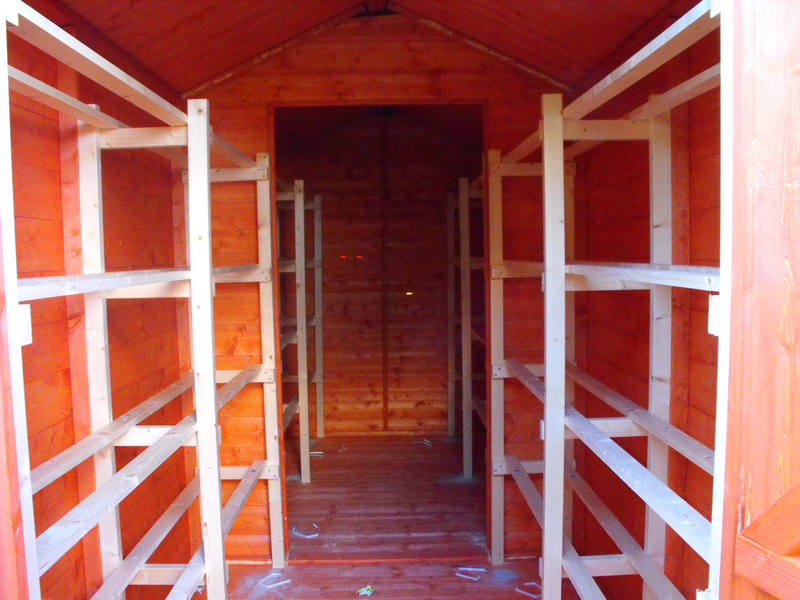 I then stacked the cops on the shelves I had made last visit, trying to keep in colour order. Some sacks were just a single colour but most had a bit of variety. Some cops are almost full, others half used - and a few cones as well. For the first couple of hours I felt that although I was filling up the shelves, the pile in the garage seemed to remain much the same size. 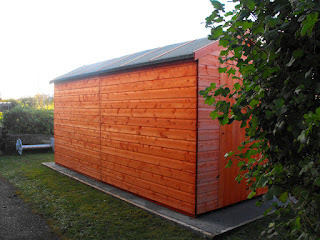 I was seriously doubting my calculations that I had made when determining the size of shed I needed. However, on Tuesday once I had put in another few hours of muscle-power and got the whole pile shifted I realised I had got my sums right. I would have space for another few cops - but not much more than that. I am now able to see what colours I have - pretty much every colour except purples - just 4 small cops, each a different shade, so there will be no purple tweed woven for the foreseeable future! 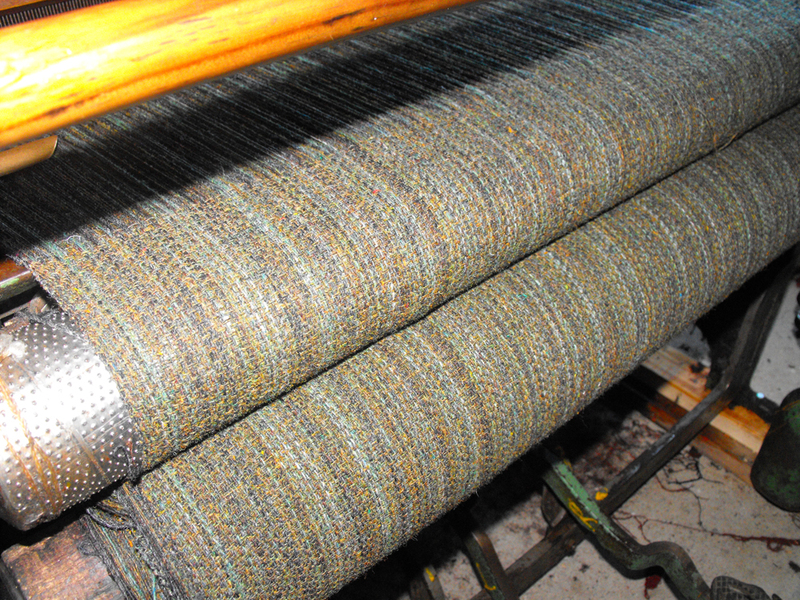 The tweed on the loom just now is green - the warp is a lovely mix of olive, sage, charcoal and mid green. 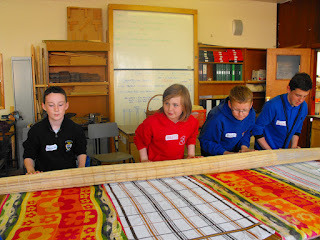 I am weaving different sections of it with different colours of warp. 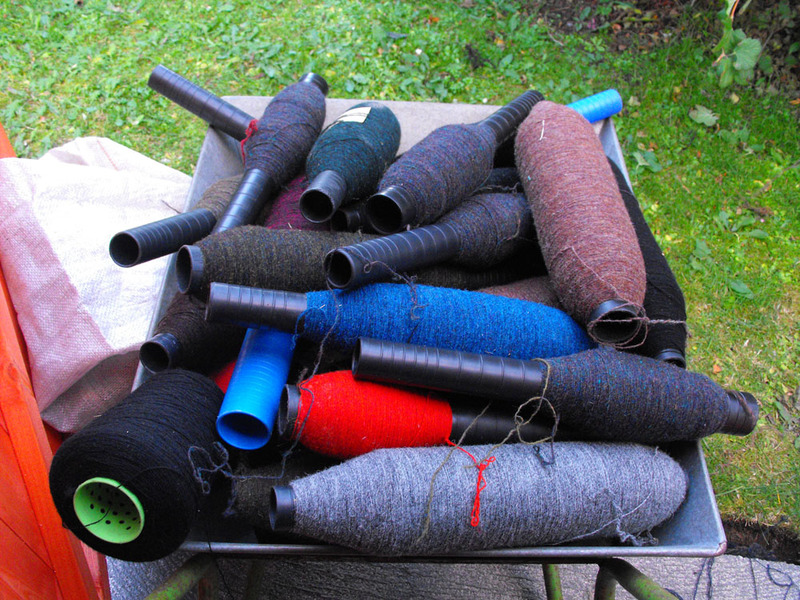 These will be used to make scarves, wraps and our Hebridean hoods. On Wednesday we had good weather and my son Simon had arrived with his girlfriend Megan to stay for a few days. 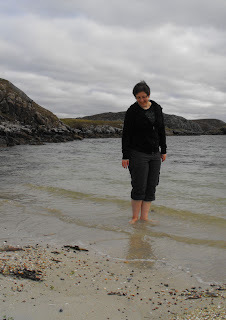 Megan has not been to Lewis before and it is many years since Simon visited the island so we took the day off and drove over to Reef. 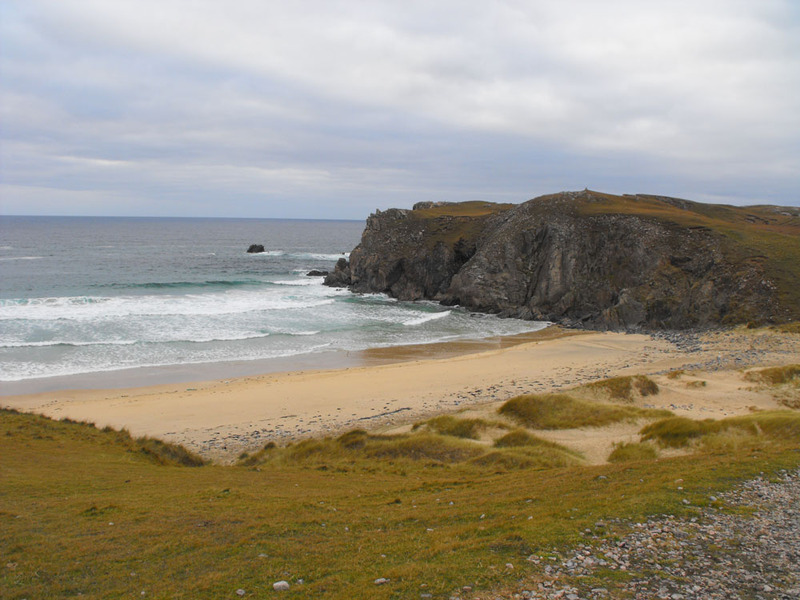 This is a beautiful beach on the west coast at the top of Loch Roag. The beach is over a mile long and for most of the time we were the only people on the beach. Megan was so entranced she took her socks and shoes off and went paddling! 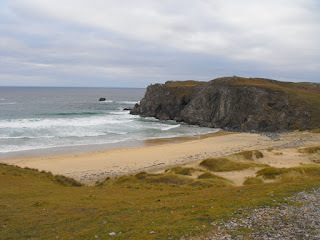 After a couple of hours walking along the beach, across to another small beach and back again, we got back in the car and drove a little further to Mangersta bay. It was not windy enough to really so this beach at its best - in stormy weather the waves are spectacular. On Thursday the weather was dismal but I had to make a delivery to the visitor centre at Calanais, so we took Megan to see the standing stones. Even in the rain she couldn't resist taking photographs, but I stayed in the car and Simon and Megan retreated very quickly! Friday was every bit as dismal as Thursday. 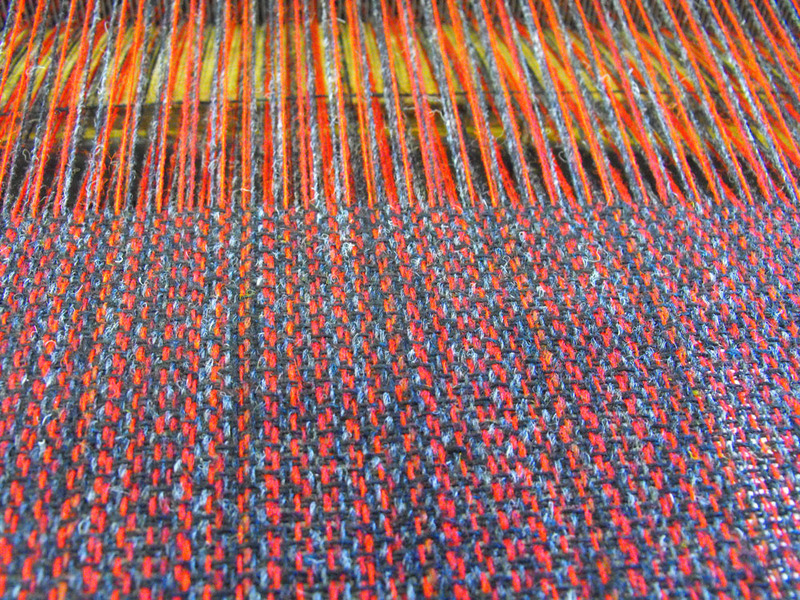 I spent the morning weaving and then at lunchtime we had to head off to catch the ferry. Driving home from Ullapool the rain was heavy, but it had obviously been even heavier earlier as the streams were all raging torrents with waterfalls in places that normally have nothing more than a tiny trickle. In several places the road was flooded and only just passable. 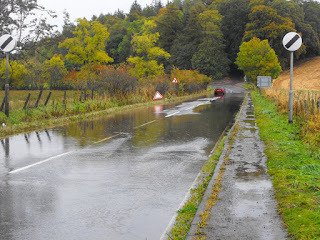 Just beyond Garve there was one part where the side of the road had collapsed. At Beauly there was a fire engine pumping water off the road. 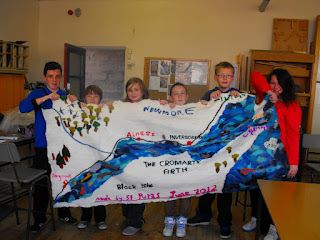 I wanted to show Simon and Megan the studio (it is almost two years since they have visited Scotland) but when we got to Inchmore we were turned back because the road was closed with flooding. We had to make a detour back through Beauly and over the Black Isle and Kessock Bridge. It was with some trepidation that I headed out to the studio this morning, but fortunately the studio was dry. My landlady told me that we missed being flooded by just millimetres and many of the houses in the village had problems. There was an abandoned car stuck in floodwater just along from the studio but most of the floodwater had been cleared and there were diggers at work clearing out drainage channels. Now it is back to work with a vengeance. Lots to do after my week away - orders to fill and stock to make so that I have something to sell at the craft fair coming up next weekend. The other day I decided to work from home. I started early, one of the benefits of working at home, but by mid afternoon I decided I wanted a break. 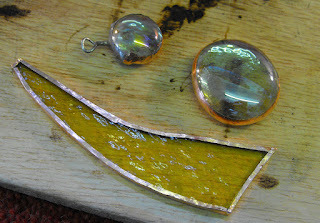 I took some time off and visited my friend Gail - a stained glass artist - click here to see her website. 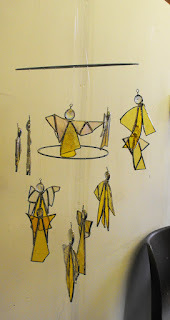 When we moved house a bit over a year ago, one casualty was an angel mobile that I had made from some left-over pieces of coloured glass using the Tiffany method. 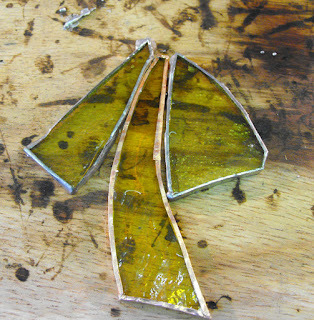 This method involves covering the edges of each piece of glass with a narrow strip of copper foil and then soldering them to join them all together. I had learned the technique many years ago when I attended Gail's very first session of evening classes. Anyway, the mobile suffered in the move and two of the angels had lost their heads - or rather the heads were still attached to the mobile, but the bodies had broken off. And another angel had a broken dress. The broken mobile had been sitting taking up space in the back bedroom - the room I use for sewing when working from home. It was in my way, so I phoned up Gail to see if she was free and willing to be distracted. I needed Gail looking over my shoulder all the time to keep me right on what to do, but after about 30 minutes my angels were all flying again. Now all I need to do is put a suitable hook in the ceiling - probably above the stairs - so that I can hang it up out of the way of any possible further damage. After that, it was back to work. The cold summer has meant that our Harris Tweed scarves and hats have been in great demand and taking time off to play has to be strictly limited! This evening I finally got my Hattersley loom working - with help from an expert. 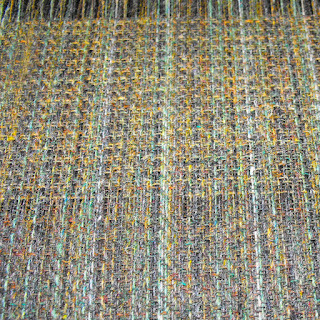 I have now managed to weave some tweed. 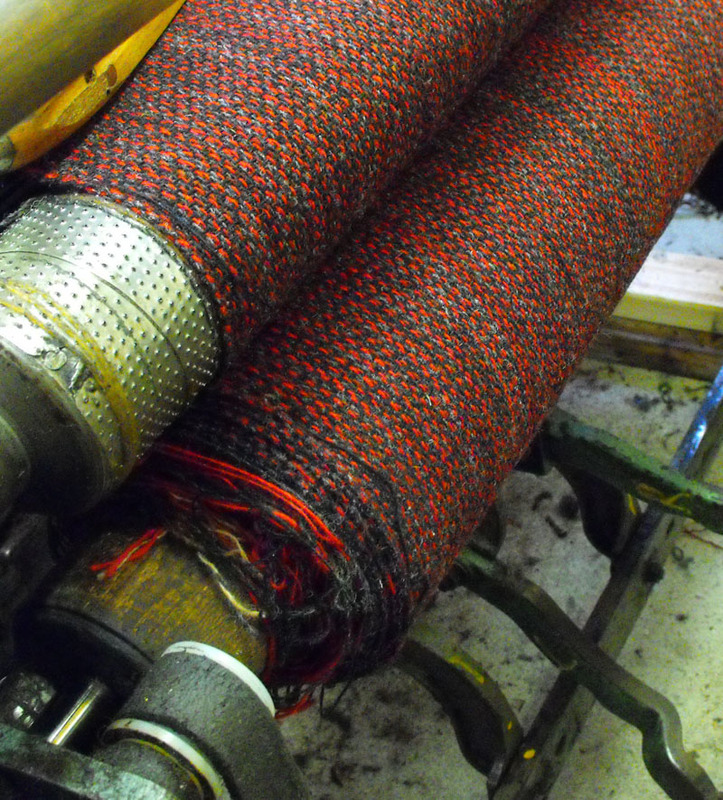 It is not without flaws, and is unlikely to achieve the Harris Tweed certification standard, but at least I am managing to make the loom function as it should. Perhaps the second half of the bale will be adequate. 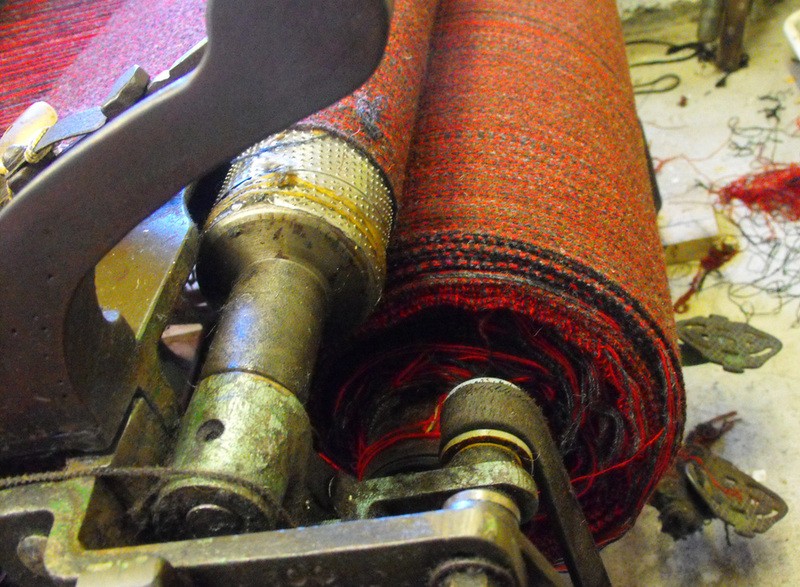 For tweed to be certified as Harris Tweed there are several criteria that have to be met. Once these criteria are met, the tweed will be stamped with the orb trade mark and labels issued according to the number of metres of tweed. I hope that I will soon be in a position where I can start using it for some of the things we make. In particular, my plan is to weave tweed that we can use for making our scarves, wraps and Hebridean Hoods as they have fringes. 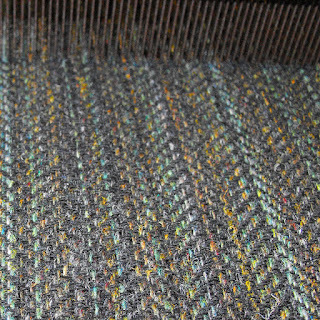 I can incorporate the fringes as I am weaving rather than having to fray off the ends as I would with tweeds bought off the roll at the mills. I am also looking forward to having tweeds which are unique to us. 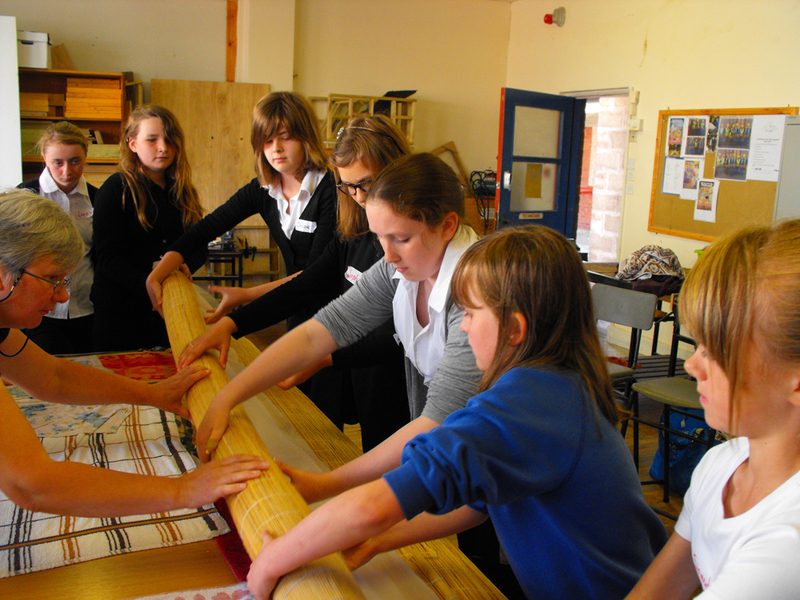 The loom will take up to 80 metres length of warp and the weave pattern has to be the same for the entire length but it doesn't all have to be woven with the same weft. I can chop and change to my heart's content. 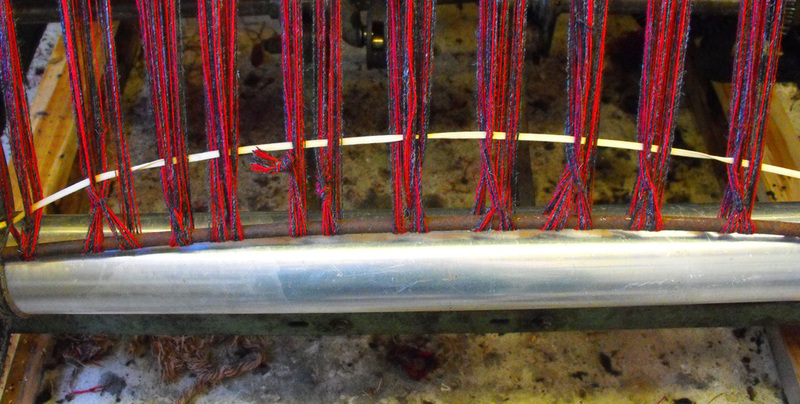 There is a system on the loom for weaving patterns with different colours - a chain of small plates with holes in them. There is a locator hole at each end of the plate and then there can be either 1 hole or two in between these. If there is one hole on the left the shuttle box will move forward one colour, if the hole is on the right it will move back and if there are two holes, it will stay on the same colour. By arranging the plates in a particular order and putting colours into the shuttle box in a set order some very complex patterns can be woven. 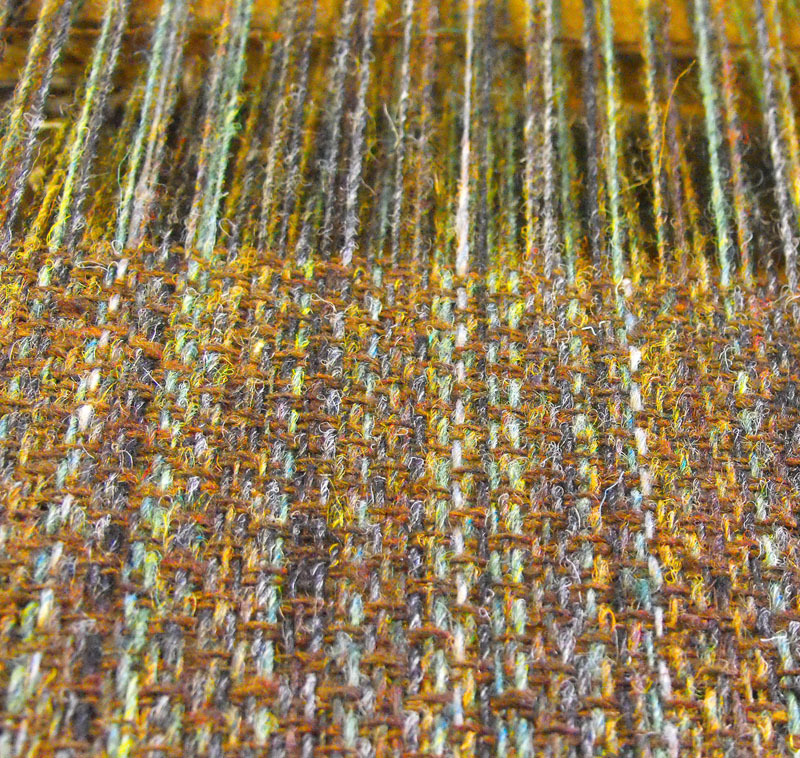 However, I plan to just get to grips with a single weft colour before I try out that side of things! In the meantime, I will still have to buy my tweed from other people as I certainly can't produce enough to keep the Anna Macneil team going. I doubt that I will ever get to the stage where we can be self-sufficient in tweed - and anyway, I don't really want to spend my time weaving plain colours, but I really am looking forward to being able to say that I made something from weaving the cloth through to finished product. I have surprised myself! And impressed myself too! 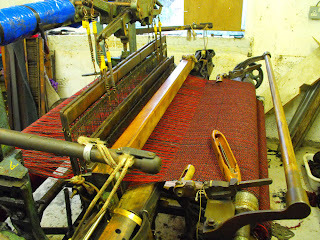 I have finished weaving the warp that was on the loom. It didn't take as much energy as I had anticipated - or perhaps it was the thrill of achievement that provided the adrenaline to keep pedalling. 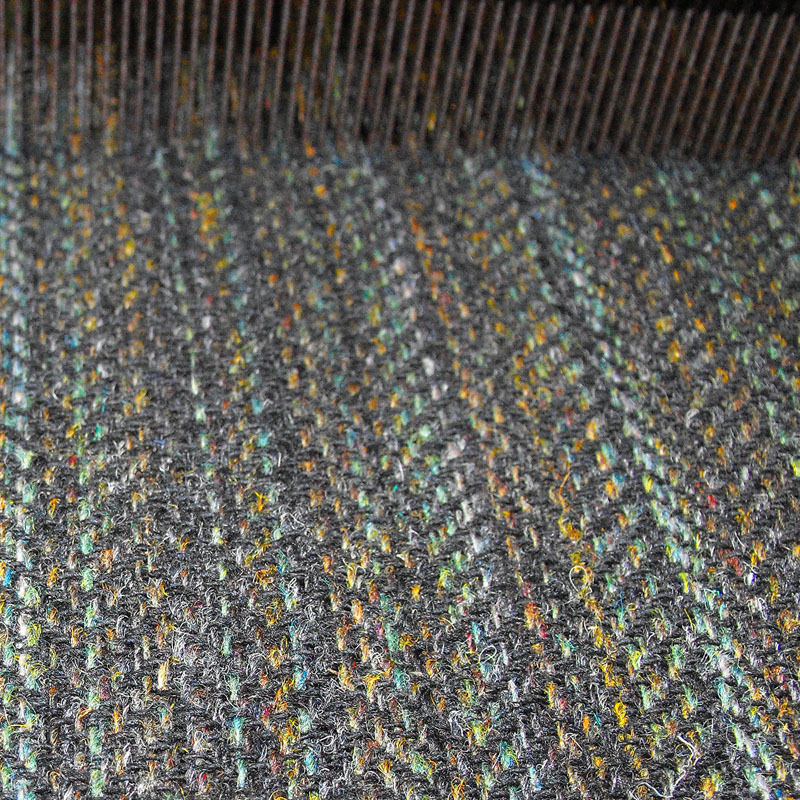 I estimate that it is taking me 20 minutes to weave 1 metre of tweed, but I am not sure how much the tweed shrinks when it is finished - the metre may end up at 80cm. 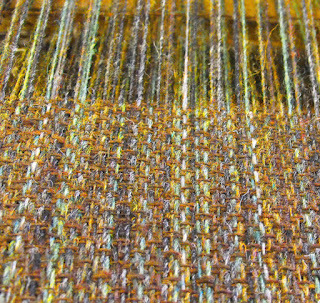 By the end of the tweed I had got to grips with repairing broken warp ends, going back a little if I had run out of weft and how to keep an eye on the weft so that I didn't run out. I reckon at least 20 metres of what I have woven will be good quality tweed. One picture shows the roll of woven tweed at the front of the loom, the other the back beam, with the warp still tied on but nothing left wrapped around the beam. 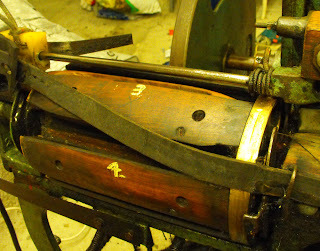 So, first thing Monday morning I will start preparing a new warp. I think I will go for an olive green warp this time but it depends how many full cops of yarn I can find in the right colours. Watch this space! This is a week-long opportunity to see artists at work. The event involves four venues, including the Anna Macneil studio that make a pleasant tour around the Beauly Firth. We will be open for longer than normal hours - 10am till 5pm daily (closed on Sunday) and during the week we will be offering drop-in feltmaking sessions. Please email for details. 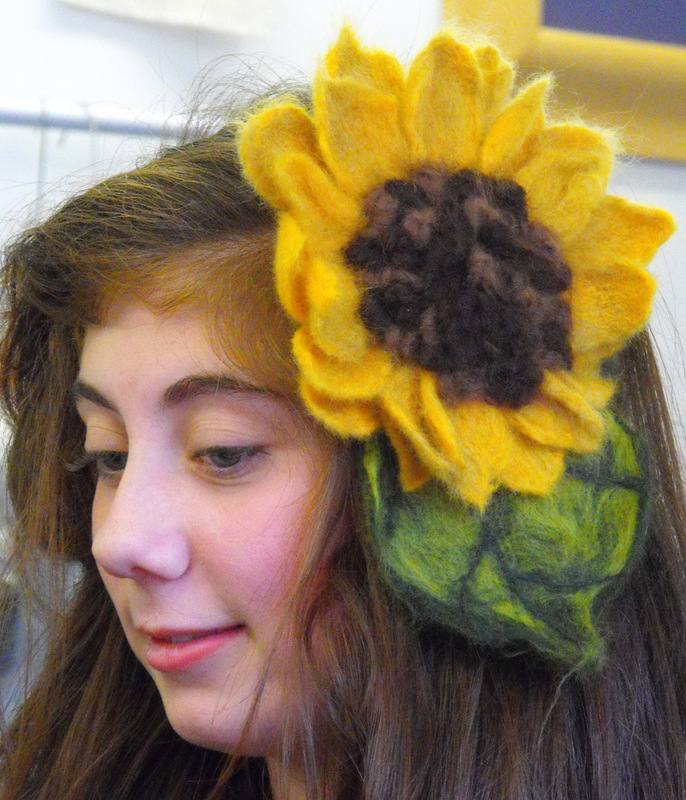 If you have never tried feltmaking, this is a chance to have a taster and see how quick and easy this craft can be. In an hour you can easily make a small wallhanging or a couple of bookmarks or perhaps a few felt beads - whatever takes your fancy. The other venues are Beauly Gallery (14 different artists - see Beauly Gallery for details), Tore Art Gallery (7 artists - again, see their website) and closer to us is the studio of painter Avril Marr who will be open from 10am till 7pm daily. All venues offer a warm welcome and you will find doing the tour a very pleasant way to spend the day. Of course, normal work will be carrying on as well - orders keep coming in, so we don't have time to just sit and play with fibres! Yesterday I posted off a special wrap - wider than our normal style, shaped at the neck and lined with silk - very sumptuous and I hope I will soon have a photograph of the recipient wearing it. Today I was embroidering a batch of scarves for Elgin Cathedral - like our normal scarves, but the embroidery is inspired by the Pictish stone that stands in the grounds of ruined cathedral. 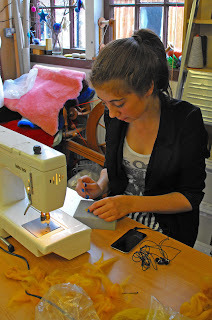 Rachel wanted to try out some ideas for a task they have been set in the art class - to design and make a "head-piece". Her idea was to make a big sunflower so we dug out the yellow fleeces along with some greens for the leaves and browns for the centre. She started off needle-felting by hand, but as sunflowers have lots of petals, I got out one of the machines and that sped things up considerably. She made lots of individual petals but left a bit of loose fibre on each so that these could all be felted together later to make the whole flower. - it took her about 3 hours, but I think it was very successful. Lauren wanted to make a pair of slippers. She had made a little pair of baby booties last year but this time she wanted some to fit her own feet. She chose 4 bright pastel shades and started building up the layers around a piece of flooring vinyl that had been cut to the right shape. 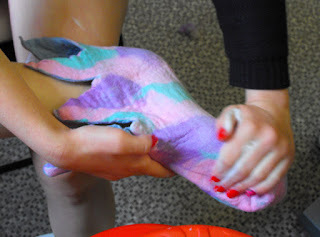 After a lot of rubbing and rolling she eventually got to the stage where she was able to start shaping them on her feet. They have ended up a bit on the big side - but very pretty. Before they came to the studio I had put the finishing touches to two Harris Tweed tunics that I had made for Canongate Jerseys & Crafts in Edinburgh. 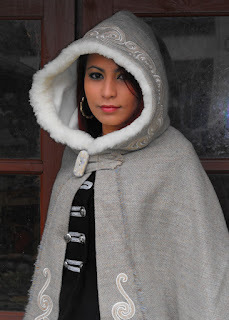 They are not part of my normal range, but I had made one for myself and was wearing it at a trade show. 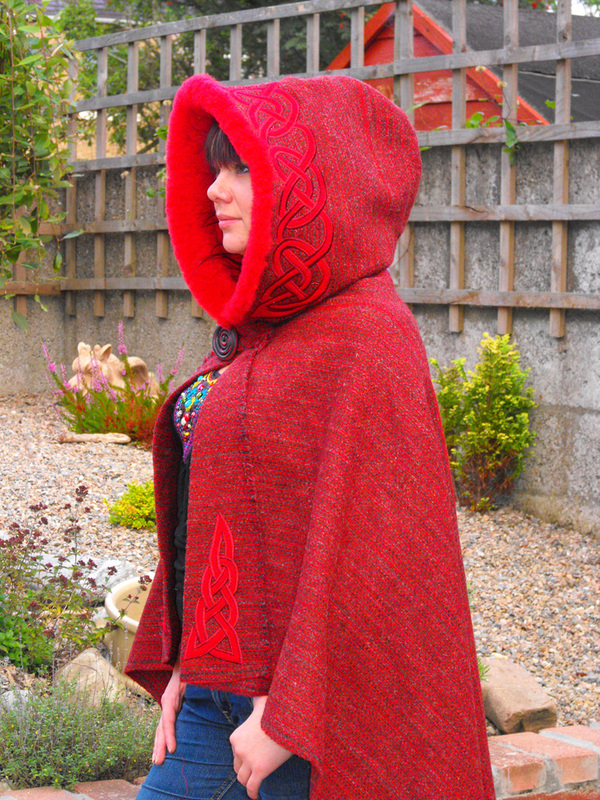 Heather spotted me wearing it and asked if I would make some for her shop. 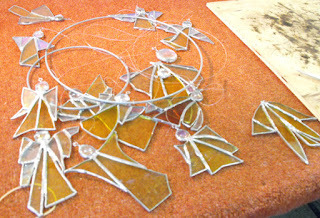 It remains to be seen how they do - but if you are interested, you can either call into her shop in Edinburgh, or email me for details. I made one (olive green) as a size 12/14 and the other (grey) as a 16/18. They are fully lined and have a zip fastening at the front. While the felting making was underway the man from the couriers came to collect the box and they are off to Edinburgh along with some Hebridean Hoods, wide wraps, scarves and hats and another box of Shetland Angels. It's not something that happens very often, but I am taking a day off work. However, it is rather a drastic way of achieving it. I spent a couple of hours today at Raigmore Hospital having a carpal tunnel decompression operation done on my left wrist. I am hopeful that it will be every bit as successful as when I had my right wrist done a couple of years ago. With Blogger you can look at the statistics and see how many people look at a particular posting, and the blog I posted when I had my last operation has consistently been one of the most viewed pages! This time it has been a simpler operation - just the carpal tunnel, whereas last time I also had a trapeziectomy. 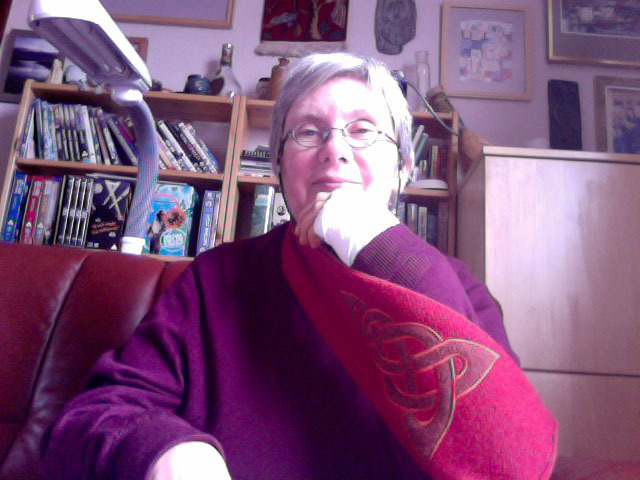 I was once again given a horrible triangular bandage type sling at the hospital and advised to keep my wrist up at shoulder height at least for today, but by the time I got home (just 10 minutes in the car) it had worked itself loose. So I dug out the sling I made last time round and it is much more effective, quite comfortable, and definitely better looking! Harris Tweed, lined with polar fleece and incorporates a small pocket to hold my mobile phone. I remembered to flip the photograph that I took using the webcam this time. The sling looks slightly odd because I am resting my elbow where it was really designed to hold the lower part of the arm. By tomorrow I should be able to use my hand again (back to the sweatshop), and in 2 days time I can take off the bulky bandage. The stitches will be out in 8 days and then it should be back to normal. As the orders keep coming in, I just hope this doesn't slow me up too much - particularly for hand sewing. 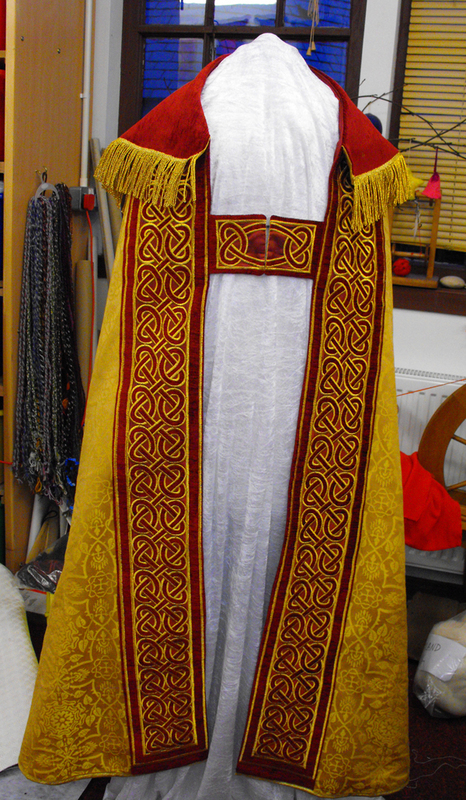 I have just sent off 4 more priest's stoles to Iona Abbey, and already they want another 6! And the Morag hats also need hand sewing around the bottom edges and I think there are about 60 needed for various shops that we supply. I had better make the most of this particular day of rest! This morning I was busy working at the studio trying to catch up on outstanding orders. The big embroidery machine was kept busy doing the embroidery for more Hebridean Hoods as we have none in stock and two of the shops we supply are waiting for more. Mid morning the phone rang and it was the owner of Scotch Corner in Oban. "Good morning Ruth, I am afraid I have a bit of a problem with your Hebridean Hoods". Oh dear, what was coming next......? "My problem is I keep selling them...... so I have none left!" So, it was a good problem to have after all. I promised to send him some as soon as we get them made up - just as well I had decided to make twice as many as were on order. All the embroidery is done now, but they still have to be made up. 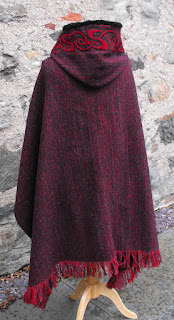 By next weekend both Scotch Corner and Canongate Jerseys & Crafts in Edinburgh should have some in stock - and I will be left with just two to take to the craft fair I am attending on 7th & 8th July at Eden Court Theatre, Inverness. Later on I checked my emails and found a lovely email from another customer. 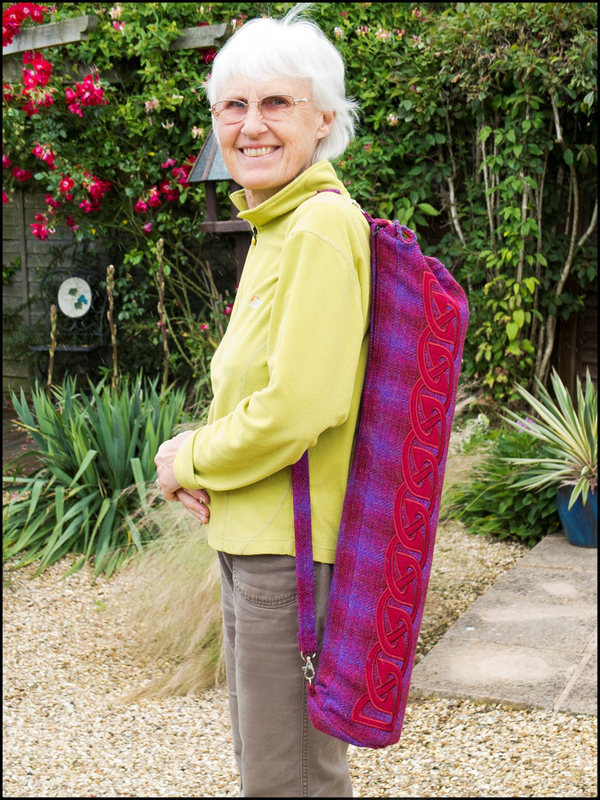 A while ago she had asked me to make her a bag in which she could carry her yoga mat and we had a bit of email and snail-mail correspondence sorting out just what was required. 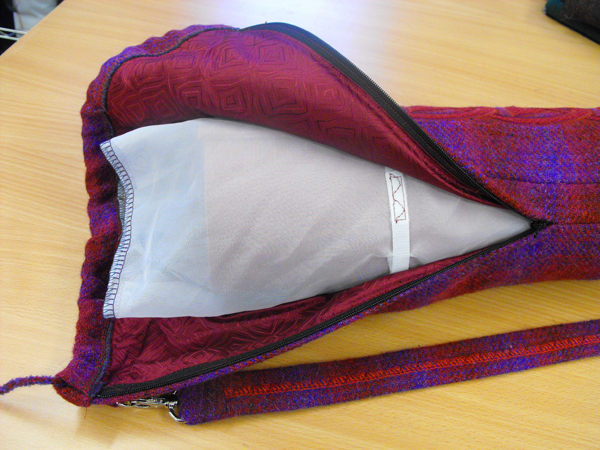 The first attempt proved just a bit too tight for mat, but I put an extra panel and zip in the side. There was still a problem getting the mat in and out and I realised it was because the yoga mat is non-slip. Not doing yoga, it was not something I had given any thought to, but testing against all sorts of fabrics proved that it really is non-slip. The solution was to use a bit of organza fabric and velcro straps to wrap around the mat before sliding it into the bag. It now goes in with ease. I posted it yesterday and it was received this morning. Jane was delighted with it - so much so that she organized a lovely photograph. I assume this is her garden - she chose the right place to stand to co-ordinate the colours! It is lovely to get such positive feedback. Here at Anna Macneil we make quite a range of bags from small purses and pouches to large shoulderbags but if you don't see something that is exactly right you can email us or come into the studio to discuss your requirements. We are always happy to develop new designs - and for the designs we already have, you can choose your own colours and embroidery designs. Whether you buy off-the-peg or opt for a custom-made bag, it will be unique - we never make two identical. 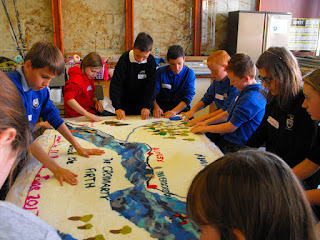 This was the second day of our two-day project to make a felt map of the Cromarty Firth. (To see what we did on day 1, click here) The participants were the pupils who are starting at Invergordon Academy after the summer holidays. 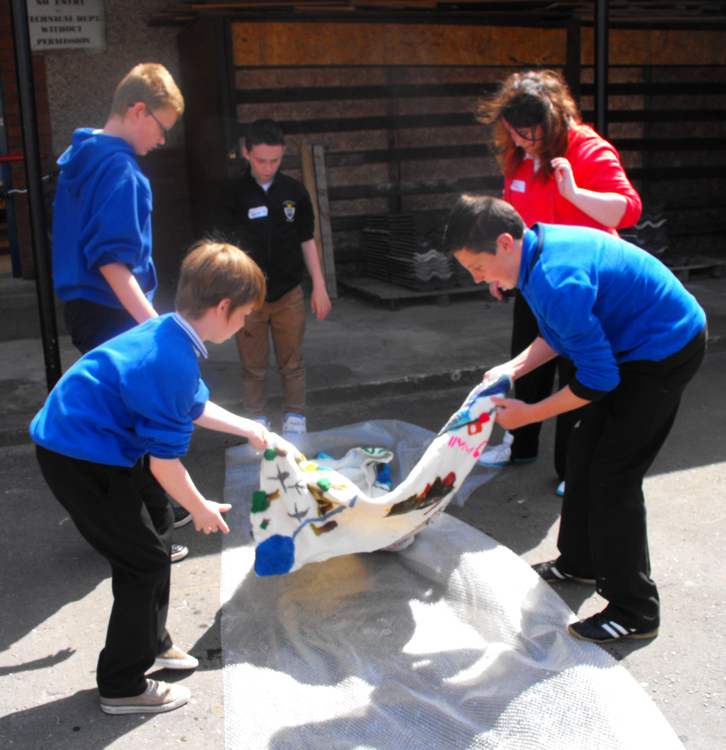 This week they are at the school getting a taste of what is in store for them as secondary school pupils - and to have some fun with feltmaking! We started off with the largest group of students doing some more needle-felting, adding in more detail and firming up on all the detail that was already there to make sure everything was fully attached. The class were very enthusiastic, but we managed to go through a packet of 50 needles! Once all the needles were used up, we moved onto the next stage. The felt was covered over with an organza sheet. This is sheer enough to see the design through the fabric, but smooth so that we could easily slide our fingers over it without disturbing any of the needle-felted details. 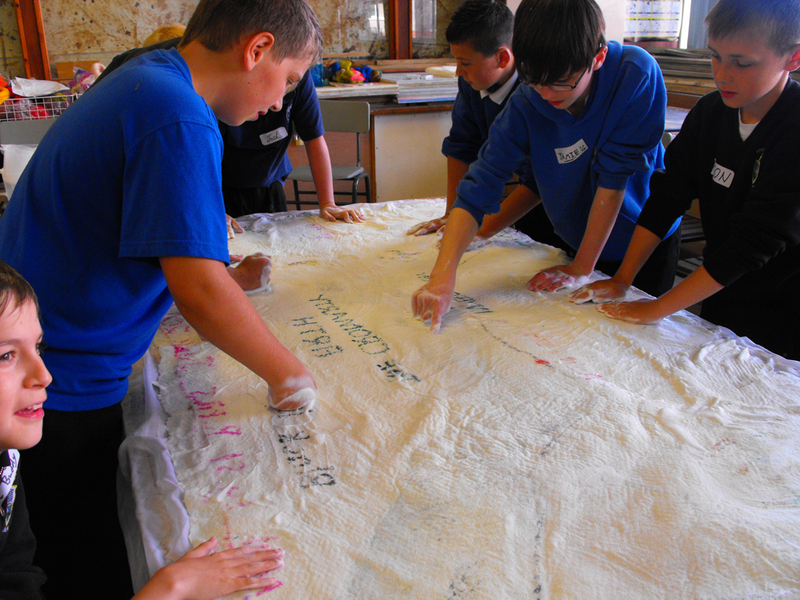 We then drizzled soapy water onto the appropriate areas and rubbed gently over the detailed areas to ensure that all the fibres were fully felted in. We had a team change during this and the new team took over with gusto. I have never seen a group of 12 year-old boys have so much fun with soapy water! 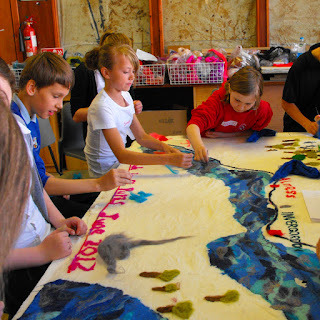 Eventually we decided that the felting on the top surface was complete so we turned the felt over and did more rubbing on the back, concentrating on those areas which had been needle-felted. Another team change and it was time to start doing the milling - rolling the felt in bamboo blinds to squeeze out the water, shrinking and firming up the felt. 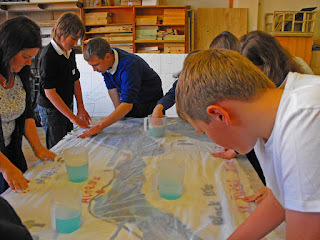 This part involved real teamwork and the students did an excellent job. 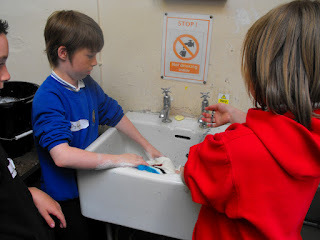 After lunch we did a bit more milling with another team and then took the felt through to the sink and rinsed out as much soap as we could. The sun was shining so we went outside to wring the water out of the felt - great fun! 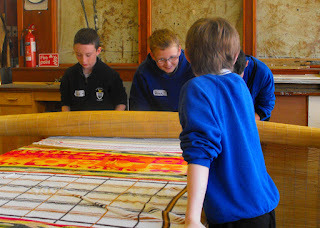 Then it was back inside and we held it up for a photograph before laying it out on the table for the Head Teacher, some of his staff and some of the other pupils who had worked on it to come and admire the work. 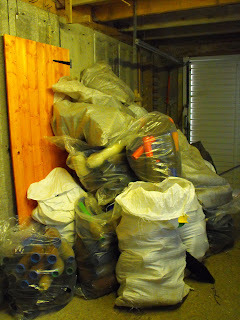 All that remained was for me to pack everything up and take the felt back to my studio. There I popped it in the washing machine for a final rinse and spin before spreading it out to dry. Next week once it is dry and pressed I will be heading back up to Invergordon Academy to deliver it, ready for their Technical Department to frame it and get it up on the wall.